The billionaire software genius behind the McAfee antivirus programs is wanted for murder in Belize. According to Gizmodo.com, Belize police claim John McAfee is the prime suspect in the shooting death of an American expatriate named Gregory Faull. Faull was reportedly gunned down at his home in San Pedro Town on the island of Ambergris Caye on Saturday - after an argument with McAfee had turned deadly. 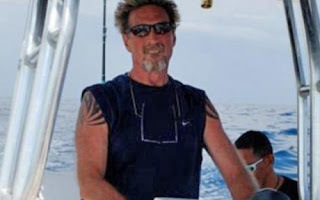 McAfee, whose software company sold to Intel in 2010 for $7 billion -- has been living in Belize for a while now. Details around the alleged argument between McAfee and Faull are unclear, but police claim Faull had filed a formal complaint about McAfee with the local mayor's office recently, claiming McAfee had been firing off guns and exhibiting "roguish behavior." Gizmodo has published a statement from the San Pedro police, which says Faull was found lying face up "in a pool of blood." Police have not established a motive. According to Gizmodo's report, police claim McAfee is currently "on the run from murder charges."